A prolific NASA sky-mapping telescope will complete its first full survey of the sky Saturday, having beamed back to Earth more than a million images of everything from asteroids and comets to distant galaxies ? some previously unseen until now. "The primary goal of the mission is to do an all-sky survey in the thermal infrared with much higher sensitivity than has ever been done before," Edward Wright, the principal investigator of the mission at the University of California, Los Angeles, told SPACE.com. "We're succeeding in that." The Wide-field Infrared Survey Explorer (WISE) has observed more than 100,000 asteroids, of which 25,000 were previously undetected. Most of these space rocks are located in the main asteroid belt between Mars and Jupiter, but some ? called near-Earth objects ? include asteroids and comets with orbits that pass relatively close to Earth. WISE has observed over 90 new near-Earth objects, and has also discovered over a dozen comets that orbit far from Earth. "Like a globe-trotting shutterbug, WISE has completed a world tour with 1.3 million slides covering the whole sky," Wright said in a previous statement. A few of these images were processed and stitched together in a new composite sky image that was released today. NASA launched the space telescope in December. 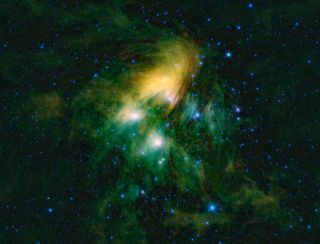 The new picture features the Pleiades cluster of stars, also known as the Seven Sisters, resting in a tangled bed of wispy dust. The photographed region covers seven square degrees, which is an area equivalent to 35 full moons. The image highlights WISE's ability to take wide shots of vast regions of space. The new image was taken in February, and shows infrared light from WISE's four detectors in a range of wavelengths. The infrared view shows the region's expansive dust cloud, and also reveals the smaller and cooler stars of the family. "The WISE all-sky survey is helping us sift through the immense and diverse population of celestial objects," said Hashima Hasan, WISE program scientist at NASA Headquarters in Washington, D.C. "It's a great example of the high impact science that's possible from NASA's Explorer Program." The $320 million WISE space telescope is designed to detect the faint glow of distant objects with instruments chilled to the point where they produce no detectable infrared light. The space observatory's infrared eyes give it the unique ability to spot the glow of cool stars, called brown dwarfs, in addition to distant galaxies that are bursting with light and energy. WISE can see the brightest of these galaxies, which are known as ultra-luminous infrared galaxies. Ultra-luminous galaxies are located billions of light-years away, said Wright, and form thousands of solar masses of stars per year. "As a result of all this star formation that goes on in these very dusty environments, they are very bright infrared sources," he said. By detecting these objects and sources of infrared, astronomers can piece together a clearer view of the universe. "WISE is filling in the blanks on the infrared properties of everything in the universe from nearby asteroids to distant quasars," said Peter Eisenhardt of JPL, project scientist for WISE. "But the most exciting discoveries may well be objects we haven't yet imagined exist." The first release of WISE data, which covers approximately 80 percent of the sky, will be delivered to the astronomical community in May 2011. The telescope, which launched in December, scans strips of the sky as it orbits around the Earth's poles ? maintaining a path over the Earth's day-night line. As the Earth travels around the sun, new slices of sky come into the telescope's field of view. It has taken six months, or the amount of time for Earth to travel halfway around the sun, for the mission to complete one full scan of the entire sky. For the next three months, WISE will map half of the sky again in order to enhance the telescope's data. This second survey could reveal more hidden asteroids, stars and galaxies. The mapping will also allow astronomers to observe any changes in the sky. "The eyes of WISE have not blinked since launch," said William Irace, the mission's project manager at NASA's Jet Propulsion Laboratory in Pasadena, Calif. "Both our telescope and spacecraft have performed flawlessly and have imaged every corner of our universe, just as we planned." The mission will end when the instrument's hydrogen coolant, which is imperative to chill its infrared detectors, runs out. Based on current estimates, Wright predicts this will happen in November. After the coolant runs out, WISE will essentially go into hibernation. But, since the spacecraft and telescope remain in good condition, Wright proposed a three-month extension of the telescope's mission in order to complete the second half of the second sky survey. In this proposed extension, WISE would capture these images in two of the four infrared wavelengths, even after the hydrogen supply is exhausted and the instruments are no longer chilled. A NASA panel advised against the extension, however, which would have added $6.5 million to the program's price tag. At the moment, there are no definite plans for WISE's future. "We're still trying to decide on the proper disposition for WISE," Wright said. "One possibility is to turn it into a telescope for education and public outreach, and make it available to take some pictures. It's very expensive to take a picture every 11 seconds, the way we've been doing it, but maybe there's a way to run it in a less data-intensive way. That would be interesting."